The iconic eiffel frame, golden wood legs and thick table surface of Charles Eames' DSW Table, but shrunk by two-thirds for children. We followed Eames' exact design for the DSW table, but to a size better suited for children. This stylish table makes a durable and versatile play table or homework desk. Eames' exploration of wood and fibreglass are easily the most recognizable pieces from an exciting period of great design and the subtle gloss finish and fun angles are a great way to introduce children to innovative design. Eames' playful, eccentric and wipe-clean designs always seemed a natural fit for children. For the DSW table, the charming one-of-a-kind geometry of the cross-wired struts is borrowed from the DSW Chair. 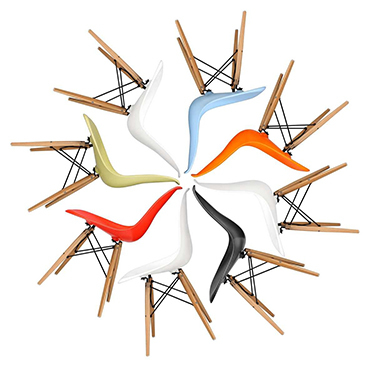 That chair was the first industrially produced plastic chair and introduced a completely new approach to furniture design when Charles and Ray Eames unveiled it in 1948. We love being able to continue their belief in, 'Getting the most of the best to the greatest number of people for the least'. That includes children too!